Today I went and got my latest tattoo. Number five, the David Bowie tattoo. Story time. I dreamed that one day I would get to see David Bowie perform. I wanted to spend any amount of money necessary to see him and, if at all possible, meet him in person. At that point, I would be an obnoxious fan and spout all about how much I loved his music and how much it meant to me, yada yada, the same old stuff he's heard all the time. And then I wanted his autograph. My plan was to have him sign my body and have a tattoo artist go over it later. Obviously that is no longer an option. So I went to my usual shop (Fallen Owl Tattoo) and told them that I needed an artist to forge an autograph. The owner (who did my first two tattoos, the first when he was just getting started as a tattooist) recommended his newest hire, Jim, who was also a DB fan. Jim and I discussed the tattoo and changed things around a few times, but we finally came up with the right one. 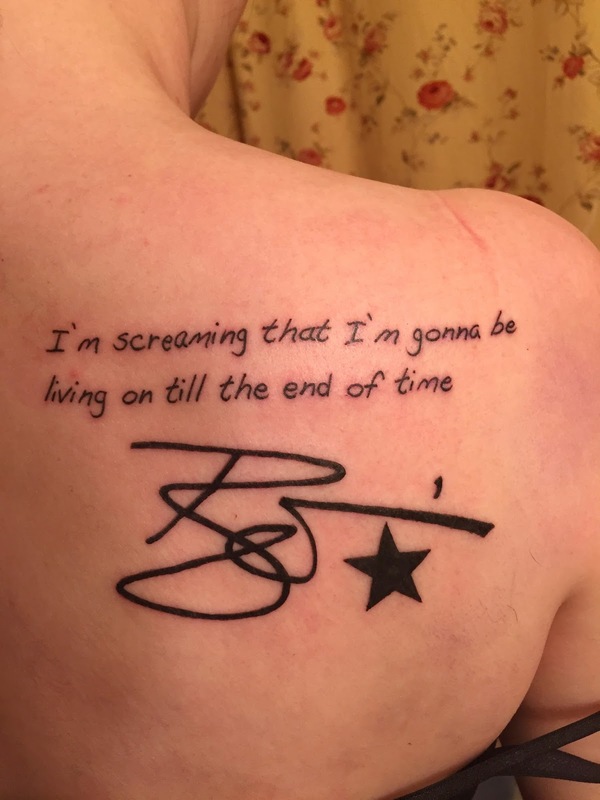 It consists of DB's (forged) autograph, a song quote, and a black star. I explained the autograph. The black star is, of course, for the last album he left us, Blackstar. The song quote is "I'm screaming that I'm gonna be living on till the end of time." It is from the song Never Get Old on the album Reality. I wanted a quote of significance that fit the situation. I thought about doing something from Blackstar as the last songs he gave us, but nothing struck me, possibly because it is still too new. Never Let Me Down was released the year I was born and it is one of my favorite albums, so that is significant to me. I also loved Heathen, Hunky Dory, ...hours and Reality. Heathen, Hunky Dory, and ...hours didn't have a song or a quote that really fit the situation, so I ended up turning to Reality which had several possibilities. Once I had this quote picked out, it was the one I kept going back to. I would wake up thinking about it. I knew that was the one I needed to get. Plus, that is how DB was to me: immortal. Part of me honestly thought that he would defy the test of time and live forever. And I hoped that he would. It's hard to see your heroes die. So in honor of David Bowie. You and your music has meant the world to me. In fact, it is hard to imagine a world without you in it, continuing to make music. You will be so, so missed, especially in my world. RIP.